We’ve had our puppy Jada with us now for close to three months, and it has been amazing adding a little furry girl to our family. Getting a puppy is definitely life-changing. The first month was intense with house training, sleepless nights, cleaning messes and dealing with her sharp little teeth ripping at everything she got her mouth close to, including skin. Ouch! We joked that it felt a bit like having a baby but it was honestly very similar, it just went by faster. All the craziness of a new puppy is made so worth it when you realize how lovely it is to have a companion at home during the day. Her love and excitement when you get home after being gone for even the shortest time, plus all the cuddles and puppy kisses. So, so, so worth it! It has also been wonderful to see the boys bonding with her and learning compassion, responsibility and how to take care of her at the same time. She is now five months old and entering her teenage years. It all went by unbelievably fast! Being five months and knowing we are not breeding her, we made the decision to have her spayed. I was super anxious and nervous on the day of the surgery but she did well and we were able to pick her up the next morning. She is a large dog, so her incision area is pretty large as well, about 5 to 6 inches long all over her abdomen. Not a pretty sigh! e from the pet store before her surgery, to avoid using the standard hard plastic one provided by the vet. The vet put the cone on after her surgery, and we headed home. When we got home, I discovered she wasn’t a fan of the cone. She was running into walls, chairs, our legs and she wasn’t able to go up and down stairs on her own as her vision was blocked while wearing the cone. The entire time she wore the cone I felt like she was sad, down and depressed. I can imagine having a huge cone blocking your face can’t be fun at all. I work from home, so I was with her all day and taking the cone off meant she was immediately trying to lick and scratch the stitches, even when sitting right there with her. Looking for alternatives online, I found the Surgi Snuggly E Collar Alternative on Amazon. It was just what we needed, and I ordered it right away. Thankfully, we have Prime, and it arrived the very next day. I was really crossing my fingers and hoping for it to work as I didn’t want her wearing that cone for two full weeks. 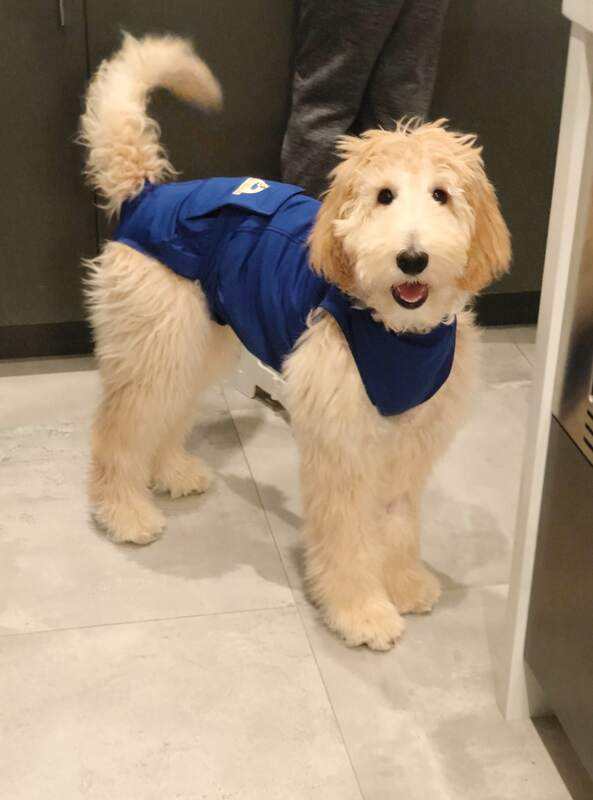 The Surgi Snuggly keeps the area covered and out of sight and assists with post-surgical anxiety as well as it gives your dog the extra comfort and compression they need for a stress-free recovery. As soon as I removed the cone and put the snuggly, she was so happy. Immediately the expression on her eyes changed. She was able to play with her toys easily and move around the house without hitting everything around. It is advisable that you still monitor your dog and watch to ensure they don’t pull, try to rip the snuggly. I haven’t had any issues with my dog, and I love that she has the freedom to recover without having to wear the “cone of shame”. 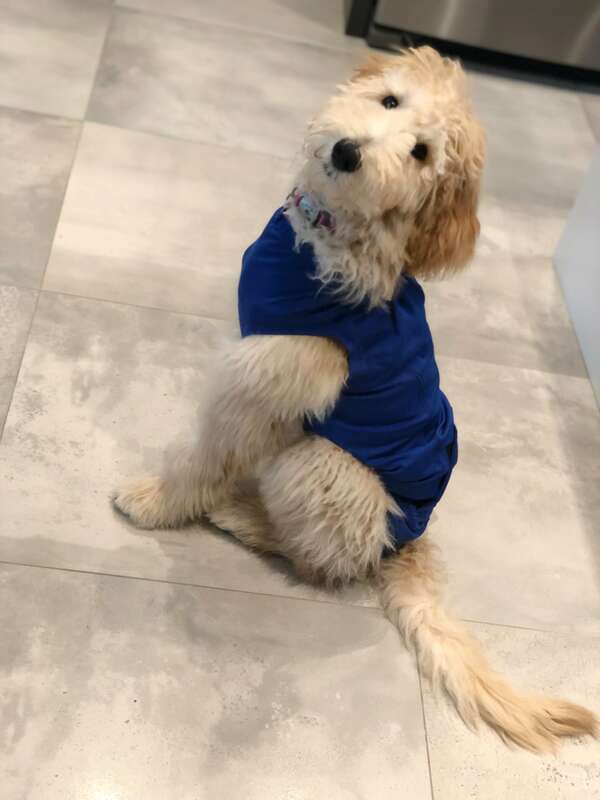 If you are finding this post as you are looking for a safe alternative, then I recommend you try the Surgi Snuggly or look online for similar medical dog shirt alternatives. I have even seen people using human shirts wrapped around or other ingenious clothing pieces to cover the area. I wish you and your pet the fastest recovery from their spay/neutering or surgical procedure. Disclosure: This is not a sponsored post, I am sharing my research to help other pet parents looking for alternatives to the e-cone. The post contains affiliate links. That is awesome, I wish I had this with my 2, my Rotti had to wear the cone longer because the vet cut open her leg trying to get her in the pen, and it wouldn’t heal right and Molson had to wear the cone as well, I felt so bad for them both. I love this idea so much more!! This is great. Was the sizing chart pretty accurate? This sounds like a wonderful alternative to a poor puppy having to wear a cone, which must restrict their vision immensely. Oh this looks way more comfortable! I’m definitely keeping this in mind.